The power of this thing is what it was used for, and the fact that it took such skill to create. A shaman’s amulets represented the guardian spirits that aided his work. Like his wooden rattles, crown of bear claws, dance apron, and red ocher face paint, bone and stone amulets were essential to his practice. 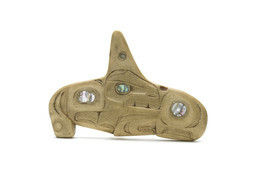 This beautifully carved example represents a killer whale; its tail is a long-beaked bird.